Your mission, should you choose to accept it, is to produce products faster, with fewer defects, remove more limitations from the customer than ever before, lower the price, increase profit and do it all simultaneously. No, I’m not kidding. We live in an era where you can customize the shoes you buy online. Pick your colors, width, length, sole type, etc. There are apps that scan your body to make online clothes ordering even better than walking into a store and trying on a shirt. They ask you which arm you wear your watch on in order to adjust that cuff a little. All this at a price that’s very competitive and an experience that’s very easy. Yes, the cabinet industry is different, but it’s coming. Remember when you used to have to call a cab when you needed a ride? Well… there’s an app for that now! Actually, there are a few apps for that now! If we think that drastic change isn’t coming to our industry, we might find ourselves in the same seat that cab drivers are in now: Scrambling to survive. If you don’t have a nested-based CNC router in your shop and some software to run it, you may be falling behind. These technologies have come so far in the past 10-15 years. They are cheaper and simpler than ever. No shop should miss benefiting from these technologies. From what I see, most shops do have some form of software and CNC. If this is you, well done, but don’t think that you can sit back. In order to see what opportunities in technology investment might be next for you, plan to get out there and see what’s available. Get out of your comfort zone. A good start is being active in relevant associations. 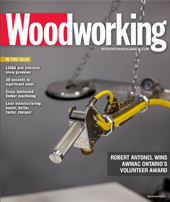 We are blessed with some great groups in our industry including the Canadian Kitchen Cabinet Association (CKCA), Architectural Woodwork Manufacturers Association of Canada (AWMAC), Wood Manufacturing Council (WMC), Bluewater Wood Alliance and many more. These associations often offer plant tours of other shops. As a supplier, I get the privilege to have been in countless shops to understand how they are run and operate. Shop tours are a golden opportunity for fellow shop owners and managers to see how others work. Trade shows are another great way to get a feel for what’s new and coming. 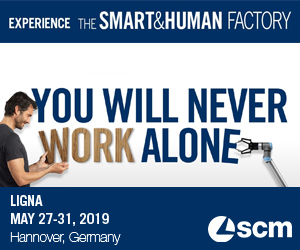 Next year we have LIGNA in Germany, which is an incredible opportunity to get out of our comfort zone and see what’s out there. Now’s the time to plan for this! Book your flights and hotels! In addition to our industry events, I encourage you to attend events outside our industry. If you’ve never been to another manufacturing trade show or shop tour, you should. Many other industries are far more advanced than ours. They offer great insight into where we are heading. Change is good, but make sure the change you are making is helping you achieve your mission: Produce products faster, with fewer defects, remove more limitations from the customer than ever before, lower prices, increase profits and do it all simultaneously.